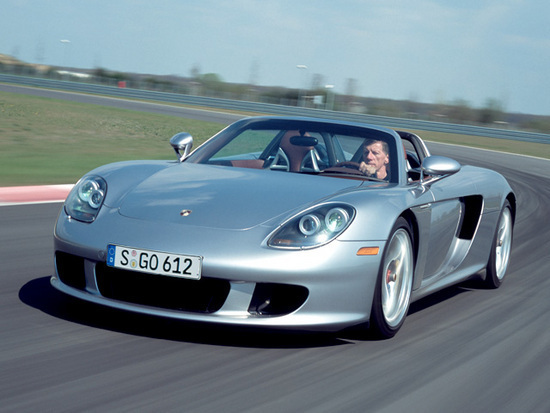 Between 2003 and 2006, Porsche made a total of 1,270 Carrera GT super sports cars. In keeping with the company's tradition of catering to buyers of past and present, they've partnered with Michelin to make customized replacement rubber for those cars. After ten years of development, the companies have developed a rubber compound and tread pattern that is meant to specifically enhance the driving experience and handling of the 2003-2006 Porsche Carrera GT sports cars. Part of the Michelin Super Sport line, these replace the current Pilot Sport PS2 tires that were recommended for the Carrera GT. The tires benefit handling, road grip, stability, and performance. Given the top speed of 330 km/h (205 mph) that the Carrera GT can achieve, that is probably a good thing. The tires are manufactured on the same line as Michelin's racing tires and are based on dual-compound technology. They are marked with the tell-tale Porsche "N0" on the sidewalls, denoting their Porsche-specific tuning. The dual-compound build gives two separate rubber compounds for the inner and outer treads. When combined with the variable contact area flexibility of the tire, grip in corners and during precise steering is improved. The belts are made of aramid fibers, which when blended and woven are five times lighter than steel, but have the same tensile strength. The new Carrera GT tires are available in 265/35 ZR 19 98Y "N0" and 335/50 ZR 20 108Y "N0" dimensions. The tires also offer up to 10 percent more tread wear on roads and 20 percent more on the track.